During the Cold War, the Bundeswehr was the backbone of NATO defense forces in central Europe. With nearly 500,000 troops and heavily armed with advanced main battle tanks and armored personnel carriers West Germany played a vital role in bolstering the NATO manpower strength necessary to resist and repel an invasion by Soviet forces. Beginning in 1965, the German Bundeswehr began to receive the first of some 6,485 Leopard main battle tanks. Replacing the Bundeswehr's American supplied M-47 and M-48 tanks, the Leopard was the first post war tank of European design introduced into German military service since the Second World War. 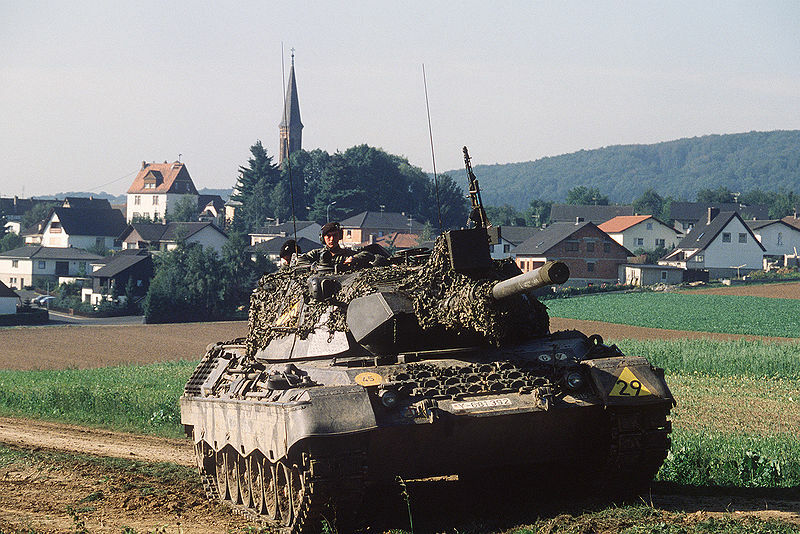 By 1987, the Heer began replacing it's older Leopards with a newer upgraded variant the Leopard 2 main battle tank. The Panzergrenadiers are effectively mechanized infantry combat forces and the motto of the Panzergrenadiers is '"Dran, Drauf, Drüber" or 'Near, On or Over' reflecting the Panzergrenadier's role in working in close proximity to armored vehicles on the battlefield. The uniform shown here is of a Hauptfeldwebel (Master Sergeant) of the Panzergrenadiertruppen. The wearer was also in the position of Kompanienfeldwebel (Company Sergeant) or as known in the United States Army as a Company First Sergeant. Typical of post 1970 issue Army tunics, the fabric is of a lighter gray than earlier model Army uniforms. It retains the black trousers worn by Army personnel. The uniform would have been completed with the wear of a green beret with the insignia of the Panzergrenadier troops depicting an armored personnel carrier positioned over crossed rifles surrounded by a wreath. Although essentially, the Panzergrenadiers share the same green coloring of the Infanterie, this uniform bears the Armor troops piping signifying the soldier's assignment with an Armored unit. The shoulderboards display the rank of Hauptfeldwebel (Master Sergeant) in officer style bullion design typical of Senior Non Commissioned Officers. The right side of the uniform displays the gold Kompaniefeldwebel-Schnur, a gold braided decorative cord representing the wearer's position as the Company First Sergeant. Also displayed are the Tätigkeitsabzeichen Streitkräfte (Military Forces Qualification Badges) the first one being the Kompaniefeldwebel Dienststellung (Company Sergeant Service Position) consisting of the Heer Iron Cross insignia and the second one underneath being the Rohrwaffenpersonal (Tubed Weapons Personnel Specialist) displaying a crossed anti-armor weapon and rifle. On the pocket is the brüstenhanger (breast hanger) pocket badge noting the current duty assignment being the Panzerbataillon 304, Panzerbrigade 8 (304th Armored Battalion, 8th Armored Brigade) assigned to Munster in Lower Saxony, northern West Germany. The unit was deactivated shortly after the end of the Cold War in 1993. The left shoulder patch of two horses crossed against a red background is the unit patch of the Panzerbrigade 8. The soldier's awards include, the Ehrenkreuz der Bundeswehr in Silber (Silver Cross of Honor), Einsatzmedaille der Bundeswehr (Armed Forces Service Medal), Deutsches Sportabzeichen in Gold (German Sports Badge in Gold), the Deutsches Rettungsschwimmabzeichen in Silber (German Rescue Swimming Badge in Silver) and NATO Medal with Former Yugoslavia clasp. The soldier was also presented the Abzeichen für Leistungen im Truppendienst in Gold (Armed Forces Badge for Military Proficiency in Gold) a round on its center and displays the German eagle surrounded by a wreath of oak leaves.as worn on the left breast pocket of the tunic. Notice the "Alt Gold" piping around the collar, this piping was applied to all Senior NCO's tunics from Feldwebel to Oberstabsfeldwebel adorning the shoulder boards in conjunction with the standard pink piping of the Panzertruppen. The Hauptfeldwebel being a Senior NCO rank has many nicknames, including Der Spieß ("The Spear") and Mutter der Kompanie ("Company Mother") amongst other names due to their position as leaders and administrative duties. Armor: 3rd generation composite; including high-hardness steel, tungsten and plastic filler with ceramic component. A Leopard 2 main battle tank of the 4/Panzerlehrbataillon 93 (4th Company, 93rd Armored Demonstration Battalion) stationed at Schulz Barracks near Munster, West Germany. The Panzerlehrbataillon 93 it was established as the German Army's first armored battalion in 1956. It received it's current designation in 1959. The insignia of the 93rd Armored Demonstration Battalion was designed at the end of the 1960s. Its background is Panzerrot ("armor red"), the color of the armored troops, "L" means Lehrtruppe or "demonstration troops", the number 93 is the battalion's number and the iron cross is the official symbol of the Bundeswehr. It is a subordinate unit to the Panzerlehrbrigade 9, which is the topic of another post.